For the second time, UK indie band from Banbury, 'Dance a La Plage' asked me to direct and shoot a music promo for them. They came up with the treatment and we planned to shoot the whole thing in a day. As with most budget music promo shoots, the day was pretty hectic. I'd not seen the location or been through the treatment with the band but i knew it was going to be about coverage, as usual. The treatment involved the story of a boy and girl who meet online and eventually meet...the difference being, the boy is a dog and the girl is a cat... it's to show the differences between people that you often don't see when you meet online. Finally... they both unmask. There's the band playing in their respective bedrooms as they prepare for their night out... so there's the kooky aspect of the band cramped into the corners of the 2 bedrooms and even a performance in the tiny toilet...just for a laugh. The last bit of the day was spent shooting some action in a bar and also out on the street where there's a scene where the girl is being followed and the boy comes to the rescue. As before, the residents of Banbury were pretty cool with us filming out and about and only one pisshead got in the way... but we humoured him and he soon moved on. I was in the USA when it needed editing, so i was working in various hotel rooms and on planes all over the US... i finally finished it back at home. Like last time, i shot the promo on my Sony FS100 and captured to my Atomos Ninja. I love working with this gear... it makes everything so easy. Shoot...check and edit...all without and transcoding. I have my Mac Laptop on location so i can just put the drives from the Ninja into the dock and check the footage very easily. As we were keeping things simple, there wasn't any budget or time for setting up complicated lighting, so we stuck to simple set-ups. I decided to go for some long, stark shadows and then put everything into a sepia kind of black and white in the edit. I'm glad i did as it gives it a really nice feel. Dan from OffBeat Music was on hand to 1st AD for me again... and i had him moving the lights mid-take to get some nice lens flares going... bless him. The edit was pretty tricky as we'd shot a lot of MSN conversations as part of the story and they looked really boring.... so i screened them over the top of the action and they worked much better. Matching the action to the performance aspects was hard and i eventually decided to ignore the background action in the performance shots and just go with the best takes regardless...i think this gives the timeline of the story a backwards and forwards aspect that makes it more interesting anyway. I edited most of it on FCP7... but i did the finishing up in FCPX... i might even do the next promo i do in FCPX now. I've got so many plug-ins ready to use and i've slowly got my head around the slightly odd way of working... and i think it's finally stopped crashing... woohoo! So, as is often the case with music promos, the first edit didn't float the boat of the band. They didn't feel the sepia vibe and they also wanted less of them and more of the story in the video. So i did a re-edit and re-graded the footage giving it back it's colour but in a 70's kind of style. It was slightly tricky as we decided to over-expose some of the close-ups and i didn't feel that they matched the wide shots as nicely as before, but the overall look went down well with the band and management. Also, FCPX has started crashing on me again...and then losing all the work. Very very annoying. Not sure what's causing it. I have just installed the FCPX version of NEAT Noise Reduction...so maybe it's that. 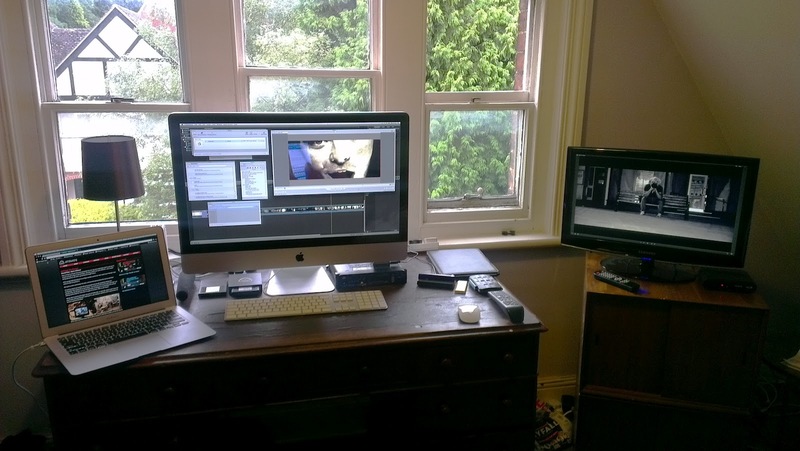 Temporary Edit Suite at home due to summer holidays and no air-con in the studio... open window works fine. Huge thanks to Dan Peters at OffBeat Music and all of 'Dance a La Plage', not to mention Mark and Nat from 'Also Known As' in Banbury.